Despite working through recovery efforts after Tropical Storm Irene, the Slate Valley Museum recently completed the conservation of three culturally significant lithographs thanks to a conservation grant from the Greater Hudson Heritage Network. Guided by the museum’s collections assessment program survey and funded through the Institute of Museum and Library Services, which concluded that “the three lithographs in the collection would benefit from conservation treatment which would remove soluble acids and reduce overall discoloration,” the Slate Valley Museum applied for and were awarded a grant from the Greater Hudson Heritage Network Conservation Grant Program to have the lithographs cleaned, conserved and reframed. Two of the lithographs are by the renowned lithographer Lucian R. Burleigh. 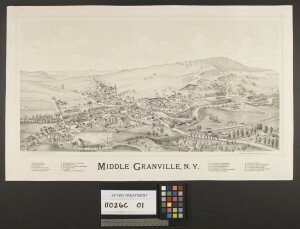 These two lithographs are titled, “Middle Granville, NY” (1890), and “Granville, NY” (1886). The third lithograph was done by F. Childes and is titled, “The Mettowee Valley from Slate Hill Granville, NY” (1873). According to the museum, these three lithographs serve as an aesthetic, cultural, and historical resource to the slate industry of the Slate Valley. Each lithograph is a birds-eye view of Granville, the heart of the slate industry in the Slate Valley, with each serving as a snapshot of a moment caught in time of the early years of the slate industry. Unique in their own right, together the lithographs form not only a picture of the early slate industry, but also help trace the early cultural history of the region through the listing of early immigrant institutions such as churches (with the Burleigh lithographs having many buildings identified). Historically, these lithographs serve as resource to locate early slate companies, locations of now non-existent buildings and roads, and of how the town of Granville was dominated by the slate industry during the second half of the 19th century. The three lithographs featured heavily in the Slate Valley Museum’s 2011 exhibit “Why Archives Matter,” which looked at the importance of archives as historical resources and interpretive tools. With their conservation complete, the Slate Valley Museum looks forward to displaying these important pieces in their main exhibit area and welcomes visitors to see the Slate Valley community from a new perspective. Greater Hudson Heritage Network is a regional service organization formed to advance and to advocate the preservation and interpretation of the area’s historical, ethnic and cultural heritages. The network promotes professional standards of excellence and fosters cooperation among member organizations and individuals through education, information and assistance. For more information, visit the museum website at www.slatevalleymuseum.org or call the museum at 642-1417.